Twenty-five years ago today, on December 4, 1963, the more than 2400 bishops of Vatican Council II, in union with Pope Paul VI, issued their first major document Council's first fruits historic Constitution on the Sacred Liturgy. While many of the issues discussed in the Council (1962-1965) had only an indirect bearing on the everyday life of the faithful, the liturgy touches virtually everyone immediately and personally. Nothing is more clearly at the core of Catholic life and practice than our public worship which, in fact, is precisely what "liturgy" means. The Constitution on the Sacred Liturgy made a powerful impact in our parishes, there for all to see and judge. Hundreds of documents on the liturgy have since been published by the Holy See in the wake of the Constitution. Thousands of liturgists eagerly plunged into the effort to implement and further the reforms. Millions of Catholics, though sometimes bewildered by it all, bravely accommodated themselves and their lifelong habits to new ways of worshipping God together. The dust has settled sufficiently now that I think it might be useful to look back across these twenty-five years to see if the considerable hopes of Vatican Council II have been achieved, to ask if, by and large, the renewed liturgy has helped us worship better, pray better, become better persons of faith. In these few pages I would like to share with you some personal reflections on the great mystery which, although I do not understand it, I hold as absolute fact, an irrefutable truth. It is something at the heart of my daily consciousness which, by God's gift, I believe with every fiber of my soul. I mean, of course, the Holy Eucharist, both as the unbloody sacrifice of Jesus in the Mass, and as the living Christ, God and man, whom we receive in Holy Communion. How can an educated person in the twentieth century, you ask, actually believe in the Eucharist, really believe that bread and wine in fact become the body and blood of Jesus Christ? Me? I believe it because, thanks to the grace of God, someone whom I thoroughly respect and love has taught me it's a fact, an awesome fact. That someone is the Church, the teaching and believing Church of the apostles and martyrs, the People of God of twenty centuries. . . my father and mother. . .the thousands of people in the Diocese of Arlington for whom I celebrate the sacred mysteries and with whom I receive the body and blood of Christ Jesus. Before the Eucharist, the senses fail us, it is true. And when we become truly conscious of that fact, we are already at the threshold of the inner mystery. When you deal with a constitution you are dealing with fundamentals. It is a trait of human nature, I guess, to get away from pondering fundamentals they're too ponderous order to get to what is more fascinating, the externals. It is far easier to apply oneself to what touches the senses, much harder to weigh the abstract and the sublime. The ultimate purpose of the Constitution on the Sacred Liturgy was not so much to effect changes in the liturgy, as to effect a change in the hearts and souls of Catholic worshippers. It seems to me that a basic principle of the Constitution was this: Liturgy is "good" to the degree that it pierces the senses, goes beyond the externals, to reach the heart and resurrect the sense of reverence for God in the individual person. People need to see through the externals of liturgical forms, see through even the central external of the priest celebrant himself, to arrive at the inner reality of what is happening, of Who is present among us. The word "Eucharist" does not appear in the New Testament. It was first used in the Didache (late first century) and then by Ignatius of Antioch and Justin. In the New Testament the Eucharist is called "the Lord's supper" (I Cor. 11:20), the agape (Jude 12), and "the breaking of bread" (Acts 2:42). The rite and the reality have existed from the very beginning, and the constant goal of the Church has been continually to try to understand and to live the Eucharist more fully. And so I thought it best if we consider each of the two elements of Eucharistic worship separately, the external ritual and the internal reality, and speak about the reverence due to each. Another important external is language. Much has been said about the use of Latin to enhance public worship. No doubt about it; Vatican Council II not only did not outlaw the use of Latin in the Mass, but called for its preservation. The Council placed on episcopal conferences the responsibility of regulating the use of the vernacular in the liturgy. Restrictions on the use of the vernacular were progressively lifted in the face of representations by hierarchies from all over the world, until by 1971 the use of the vernacular in public Masses was left entirely to the judgment of episcopal conferences, and to the judgment of individual priests for private Masses. My preparation for the priesthood was entirely pre-Vatican Council II and was veritably steeped in Latin. Five years of Latin grammar classes were followed by ten years of classroom and liturgical usage of Latin. I confess that I was pretty proud of my Latin skills Italian pronunciation and a vocabulary that could not be stumped (that is, if you kept the conversation to things theological and canonical). At first it was a disappointing thought for me to have to begin saying Mass in English. But what I discovered surprised me. Now people were listening to the meaning of the words I was saying and they could now tell quite easily if there was sincerity and devotion in my words, my inflections, my pace of delivery that were largely hidden from their ears when we had said Mass in Latin. This in turn forced me to a greater reverence at the altar, and I often thanked the Holy Spirit for Vatican Council II. It puzzled me later that what I found to be of such value for reverence in the liturgy some perceived as a slippery road to irreverence. Reverence, however, is not an inherent trait of one language over another. Rather it is the trait of a person who is aware of God's presence and action, no matter what language he uses to express that awareness. No bodily posture so clearly expresses the soul's interior reverence before God as the act of kneeling. Reciprocally, the posture of kneeling reinforces and deepens the soul's attitude of reverence. He was known to be of human estate and it was thus that he humbled himself, obediently accepting even death, death on a cross! So that at Jesus' name every knee must bend in the heavens, on the earth, and under the earth, and every tongue proclaim to the glory of God the Father: JESUS CHRIST IS LORD! Before the Vatican Council even ended, there were new words and phrases inserting themselves into our liturgical vocabulary, while some venerable old phrases, without any warning, became archaic. The new jargon, it must be pointed out, was not created by the Constitution on the Sacred Liturgy. At times, while waiting for the procession to start down the center aisle for Mass, I have heard my name announced to the congregation as "Our presider today is...." To be perfectly frank, "Our priest today..." is so much more meaningful, even when it refers to a bishop! What I had known only as the sacrament of penance was now known as the sacrament of "reconciliation." The word "penance" went antediluvian. When "Extreme Unction" was renamed the "Anointing of the Sick," the sacrament became more widely used since people understood by the change in title that you need not be at the brink of death in order to ask for the sacrament. I have always wondered if the new title of "reconciliation" did not have the same effect, in reverse, so that fewer and fewer people would ask for the sacrament, thinking the sacrament was now intended only for those in mortal sin and therefore in need of reconciliation with God. A lot of those old phrases, tried and true through centuries of venerable use, still say it best. The temptation is fierce, and I have rarely seen anyone successfully overcome it. When a very special event is to be celebrated with a Mass, e.g., the installation of the bishop, or his funeral, those in charge of planning the liturgy will invariably feel it appropriate to make the liturgy longer, more complex, more elaborate. If there are twelve verses of a hymn printed in the hymnal, all twelve will be sung. After all, this is a special occasion. The longest Eucharistic prayer is selected de rigeur. Musical interludes sometimes become mini-concerts. Holy Communion, of course, must be administered under both species, in spite of any logistical problems with the size of the congregation. The principle seems to be: Whatever can be added, should be added to the liturgy of a special occasion. What ever happened to these venerable old sounds? Well, I can understand why, at the beginning of the renewal, they were left behind in the excitement of embracing such a variety of new forms and substitutes. Are the three traditional sounds gone forever? Hardly. The era of renewal is still underway, and another sign of progress is the already visible return of these three jewels of sound. They will be back, not to dominate, but to take their rightful and honorable place in the rich mosaic of Catholic ritual. Cardinal Joseph Ratzinger wrote this memorable phrase: ". . .liturgy can only be liturgy to the extent that it is beyond the manipulation of those who celebrate it." (Feast of Faith, p. 85) The liturgy, by its very nature, is the public patrimony of the whole Church; it cannot be the possession or hallmark of an individual priest or a particular parish community. There is heard at times the complaint that liturgical norms tend to stifle the freedom and spontaneity that should mark private and public worship. "We are a church of charity, not law," they say. "Let the spirit blow where it will. Don't shackle it; don't restrain its power by placing it under law and order." By happy coincidence, I happened to be in Rome on January 25, 1983. That was the long awaited day for the promulgation of the new code of canon law that had been in preparation for more than a decade. As an old canonist myself, I was especially delighted to see and hear the Holy Father, Pope John Paul II, personally promulgate the code in the Hall of Benedictions above the front vestibule of St. Peter's Basilica. In his talk the Holy Father spoke of the same complaint about the "intrusion" of law into matters of the spirit. He said that Church law does not substitute for faith or grace or charisma or charity. No, it creates the best conditions whereby those primary values have a chance to flourish unimpeded in the vast society of the Church and the world. Law creates the conditions for the development of the important things. By the same token, the rubrics of the liturgy are not established to substitute for true worship, but to create the external conditions so that the interior values of the liturgy have a better chance to achieve their purpose. I sometimes visualize the Mass as three-dimensional in its unifying power. Like the altar on which it takes place, I see the Mass with a certain length, width and height. The dimension of length reaches back as a memorial across twenty centuries to the Last Supper and Calvary. Its width is all-encompassing, as wide as the earth, embracing the entire body of the faithful around the world. Its dimension of height makes it reach up to the one true God in heaven in adoration, thanksgiving, satisfaction and petition. The long memory of the Church through the centuries leads to one conclusion: Simple and straightforward observance of the norms for celebrating Mass creates the best conditions for the inner reality of the liturgy to be grasped by the greatest number of people. As a rule, when Mass is celebrated in total accord with the Church's norms, the liturgy has its widest and deepest effectiveness among people. To the degree that the externals of the liturgy can pass beyond our senses of sight, hearing, touch, smell and taste, and reach the heart and soul, to that degree will the externals achieve their purpose in the liturgy. As carefully planned and beautifully executed as a particular liturgy might be, if it does not enter the heart, the psyche, the intellect, the memory, the will, the spirit, it fails in its purpose. It must reach the human soul in its depths. It is there, in the inner sanctum of one's soul that a sixth sense can be nourished, enlivened, focused sense of reverence before the presence and action of God Himself. If I think that I have given a fairly good homily, I have always had the custom, even from the time of my ordination to the priesthood thirty years ago, to type it out afterward and save it. I have a few "keepers" from my first months as a young priest in 1959, a few years before the Council began. When I look at those early sermons now, in light of Vatican II, I can hardly believe that I once had the audacity to consider them good and decent sermons worth saving. Frankly, they are awful sermons, too long and involved, academic and abstract, as engaging as a filibuster. They did not have a minimal chance of moving anyone, of touching the hearts of anyone, or helping people arrive at the inner mystery of the Eucharist. I really was, if I say so myself, a maladroit young preacher. The body of Christ is beyond all sensible perception. Can it happen at Mass that we stop at the sensual perceptions and never reach the mystery beyond? Sometimes going to Mass can be like listening to a foreign language, not a word of which you comprehend. The foreign words touch your sense of hearing, but do not penetrate the understanding of your mind. The liturgy can sometimes touch the senses of sight and sound. . .yet the heart and soul do not comprehend. The visible signs of the liturgy are necessarily limited in conducting us to the inner mystery. In the final analysis, the mystery will always remain a mystery. "Senses cannot grasp this marvel; faith must serve to compensate" is a line from the wonderful old hymn Tantum Ergo sung at Benediction of the Blessed Sacrament, a Eucharistic liturgy that truly belongs in the Church of Vatican Council II. Before the Eucharist, the senses fail us, it is true. And when we become truly conscious of that fact, we are already at the threshold of the inner mystery. A key phrase of the Constitution stares the goal of liturgy, to move people to "full, conscious, and active participation" (SC 14). Of the three adjectives used, conscious, and active word "active" seemed to be the one favored by most liturgists and pastors when first implementing the new liturgy. "Active participation" became the motto of those times. Yet, of the three adjectives I really think that the most important one is "full" as in full participation. The word "active" can be taken to mean merely external participation without much attention to interior worship; "conscious" can mean merely internal participation without joining the worshipping community. But "full" means both together, internal and external participation. People are to take part in the Mass "conscious of what they are doing, with devotion [internal] and full collaboration [external]." (SC 48). 1) He is instructed (Scriptures, homily). 2) He is nourished (Holy Communion). 3) He gives thanks to God (the meaning of "Eucharist"). 4) He offers Christ and himself in sacrifice to the Father. 5) He unites with God and his brothers and sisters at worship. If the words "full, conscious, and active" are the key words for all participants in the liturgy, what is the key word for the priest? I think a key goal for the priest is "effective" participation; the Mass is to be celebrated "effectively," that is, so people can receive the "very many fruits" the Lord intends by it (CCL 899.3). True, there are some people of extraordinarily developed faith and reverence for whom the demeanor of the priest at the altar does not mean that much, one way or the other. But for most of us, the manner in which the priest celebrates Mass has a lot to do with people's ability to worship well and to receive what the Lord intends to give through the Mass to each soul. In the matter of personal participation in the Mass, the Constitution states that, as faithful dispensers of the mysteries of God, priests "must lead their flock not only in word but also by example" (SC 19). The priest's demeanor, his sense of reverence, his sense of the sacred, his ability to enhance, not intrude on, people's awareness of the inner mystery, mean so much. But it is not only the demeanor of the priest that means so much to full, conscious and active participation; it is also the demeanor of fellow participants that counts. I have always thought that there are two basic ways to draw a soul to God through the liturgy: (1) the power of the liturgy itself; and (2) the good example of others' reverence in the liturgy. One can grow through the liturgy in two ways basically: (1) by achieving an awareness of God's presence and action; and (2) by associating with others who are achieving it. The liturgy will draw people to that awareness if it remains true to its purpose, affirming the deposit of faith entrusted to the Church, and helping people profess that faith in union with the whole Church. "The Eucharist is above all else a sacrifice," wrote Pope John Paul II (DC 9). The Mass, you can say, has three basic aspects  sacrifice, meal, and community. But of the three aspects, the sacrificial is the primary one, even though it is the one most hidden behind the externals of the ritual. The signs and symbols of the Eucharistic rites, however, conceal rather well the inner sacrificial action. Nothing on the altar looks like a sacrifice; no particular action of the priest or people resembles the performing of a sacrifice. It is the great mystery. 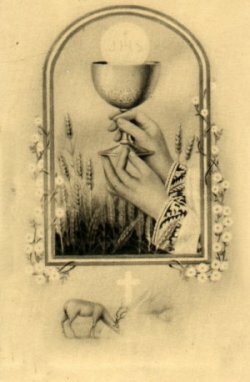 "The mystery of this water and wine. . .the mystery of faith" are phrases that the priest repeats in every Mass. The priest might well be joined by the unordained in celebrating the other two aspects of the Mass, by those who assist him in the distribution of Holy Communion and those who affirm with him their unity of faith and worship as a single community of God's people. But in the performance of the sacrifice, he stands alone. No one pronounces with him the words of consecration. In this he is exercising the ultimate role of priest; in this he is affirming the uniqueness of the ministerial priesthood of the New Testament; in this he acts most perfectly in the person of Christ. Perhaps that is why, in order to penetrate the sacrificial reality taking place on the altar, people depend so much on the leadership of their priest. There he stands alone as the steward, the administrator, the dispenser of the mysteries of God (I Cor. 4:1). The spirit and power of the liturgy usually will not engage the participants in the sacrificial aspects of the rite unless that spirit and power are evident in the priest who is leading the liturgy. "Arouse and enlighten" the priest must constantly strive to achieve, to arouse faith in the sacrifice by his reverence, and to enlighten that faith by his instruction on the mystery of the sacrifice. "It is evident," concluded the Extraordinary Synod of Bishops in 1985, "that the liturgy must favor the sense of the sacred and make it shine forth. It must be permeated by the spirit of reverence, adoration and the glory of God." In the early years of the reform, active participation was so emphasized that quality and achievement were often gauged solely on the level of external performance, responding, exclaiming, proclaiming, celebrating, etc.  few checked to see if the sense of the sacred pervaded. Banners and balloons, prose and poetry, orchestration and choreography were so highlighted that people often had no good chance to adore. When gestures, vestments, movements, words, postures, singing, sights and sounds of the ritual do not express the interior awareness of the sacred, they are only clanging cymbals, not effective symbols. There is an interesting insight, I think, in the new Code of Canon Law, in canon 913 which speaks of the preparation and basic comprehension which children should regularly have before making their first Holy Communion. Should the child be in danger of death, however, the canon indicates that the preliminaries may be dispensed with and the child given Holy Communion provided that he can do two things: (1) distinguish the Body of Christ from ordinary bread; and (2) receive Communion reverently. Reverence for the Eucharist is never dispensable, even in a child, even in danger of death. A sense of the sacred, a sense of reverence, is due not only to the Eucharist, but to other persons too, and to places and things. I am always struck by a renewed sense of the sacred during the rite of dedicating a new church by which it becomes sacred, a sacred place, set aside exclusively and perpetually for the worship of God. It makes me conscious again of "the reverence due to the house of God" (CCL 562) and the reverential silence we keep in church in the presence of the Blessed Sacrament. Going to Mass is basic to a Catholic's self identity as a Catholic. After all, "The celebration of the Eucharist is the center of the whole Christian life both for the universal Church and for the local congregations of that Church" (ES 1). ". . tin the most blessed Eucharist is contained the whole spiritual good of the Church" (PO 5). The person who places going to Mass on Sunday higher than anything else that day is rightly referred to as a "good Catholic" or a "practicing Catholic." If going to Mass is not the heart of Catholicism, a lay friend of mine recently asked, "then what is?" "Five years ago, in speaking at some length about this matter, I mentioned that 'throughout the United States there has been a superb history of eucharistic participation by the people, and for this we must all thank God' (Ad limina address of July 9, 1983). The time is ripe to renew gratitude to God for this great gift and to reinforce this splendid tradition of American Catholics." Through baptism and membership in the Church, a believer undertakes a whole new network of rights and obligations. Sure, there is the obligation of Sunday Mass, but by the same token Catholics have a clear right to good liturgy. If the aim of the liturgy is to draw out and vivify people's highest and noblest religious aspirations and affirmations, then the job of parish liturgy is a very lofty one, and success comes not that easily. Nevertheless, the people have a right to good liturgy. I think it can be said that if reverence does not pervade a liturgy, it will fail in its purpose even if all the liturgical roles within it are correctly carried out. Conversely, a liturgy that is not competently executed can sometimes achieve success if it is pervaded by reverence for the presence and action of God among us. Twenty-five years ago today the Constitution on the Sacred Liturgy gave birth to a remarkable worldwide renewal in the way we worship God together and receive His gift of sanctification. The transformation is well underway and, thanks to the Holy Spirit, there are palpable impulses everywhere, prompting us to a greater reverence for the Eucharist. Indeed we are privileged witnesses to "a new Pentecost." Published by the Diocese of Arlington, Office of Communications, 200 N. Glebe Rd., Suite 610, Arlington, VA 22203.